In his description of Eugene Delacroix's life work, Charles Baudelaire writes about the large works of artists of the time as machines. Delacroix himself referred to some of his large works as machines as they have many different objects, people and qualities that had to be structured and painted with immense precision for the work to succeed. When Riley began touching the steel remainders, considering what to do with them, she was aware that they are related to very different kinds of machines: the gas and Diesel engine. This work represents a folding together of concerns that have been present in her work since the start with new information which include issues of industry, technology and anthropology. Earlier work saw structuring elements and motifs that were drawn from responses to both nature and culture - (culture as in architecture, sculpture and painting). In the "Machine Series", found pattern becomes the organizing principle and springboard to concept. The pre-determined shapes from laser-cut sheets of steel are by-products of the auto-engine production. Adding "industry" as content to on-going issues of culture and nature increases potential for the studio, long engaged with formal problems of fusing (painterly) language, systems and principles of order with that of improvisation. The found patterns of the steel remainders become new armatures for draping or delineating solid or veiled areas of color, simultaneously evoking the figure, landscape industry and technology. 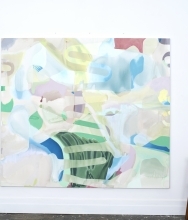 Riley is known for her abstract and semi-abstract paintings in which the primacy of drawing, color, line, luminosity, monumentality, nature and the built environment thread throughout her oeuvre. The “Machine Series”, her newest work, uses found patterns of steel remainders from the auto-engine industry to become armatures for draping or delineating solid and veiled areas of color that explore possibilities for abstract painting, integrating concepts of technology, anthropology, industry and nature. 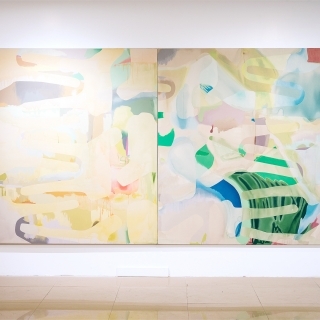 The painterly traditions of lyrical abstraction, gestural abstraction, hard edged geometric abstraction and elements of realism combine in Riley's work, discovering a sweet spot in abstraction that speaks to a world that has grown more complex with the migration of people, cultures, ideas and technologies. In addition to making abstract paintings, large scale steel sculptural projects have developed from Riley's studio practice. She recently unveiled a 65' x 8' x 8' long permanent commission at Mercedes House in Manhattan NYC, and a 50' x 18' x 8' steel installation for Cummins Inc., in Indianapolis. The sculptures, titled "Big Bright Steel”, are made of repurposed laser-cut sheets of steel from the auto-engine industry executed in collaboration with a colleague. Riley’s work has earned critical attention for her solo exhibitions in New York, Boston, Washington D.C., Las Vegas and across the US. In 2017, she received a three year studio space subsidy grant from Two Trees Cultural Foundation in Dumbo, New York. In 2004, Riley received the Award in Painting from the Massachusetts State Cultural Council. Riley’s work is held in many public, corporate and private collections. 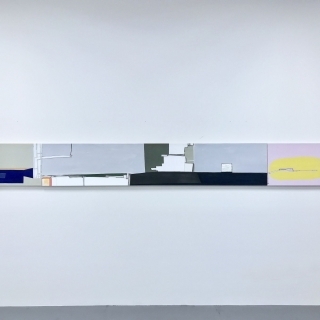 Riley received her MFA from The Milton Avery Graduate School of the Arts-Bard College, 2001, BFA from Tufts and The School of the Museum of Fine Arts Boston, MA in 1991, and a Diplôme Superieur d’Etudes Francaises 1986, Université de Rouen, Rouen, France. Riley is active as a teacher, curator, panelist and guest critic. For many years at the Harvard Graduate School of Design Riley co-developed and led the Rome Seminar in Rome (1996-2013). She has taught at Indiana University, Pratt Institute, MICA, Columbia and Yale, MIT, RISD among others. Riley is a contributing editor at ArtCritical.com, Chairwoman of the Board of Directors of Triangle Arts Association, an independent curator in NYC and at Indiana University Center for Art+Design in Columbus, IN. She is also an Essayist who has written numerous exhibition catalogue essays for contemporary artist. Riley has written critical reviews for Artcritical, the New York Sun and the Brooklyn Rail. Riley lives and works in Brooklyn NY.